Hillsboro had the final goal and the victory as they defeated Washington 4-3 in boys soccer Tuesday evening in the Frontier Athletic Conference. The teams traded goals throughout the match, with the Indians taking the lead three times, and the Blue Lions quickly equalizing after each goal. After the game went to 4-3 in favor of the Indians, Washington ran out of time and was unable to tie the game. Two athletes had hat tricks in the match: Marshall Ward for Hillsboro and Blaise Tayese for Washington. Payton Bell added a goal and and an assist for Hillsboro, while Logan Crafton and Spencer Rudy also asssited goals. 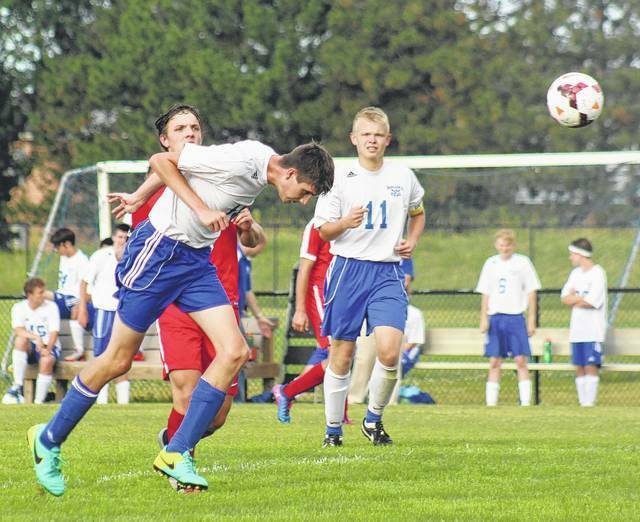 Tayese’s goals were assisted by Jack Luebbe, Nate Horton, and Max Schroeder. Hillsboro is now 3-2. This was Washington’s first game. In other FAC boys soccer matches on the new league’s opening day, Chillicothe defeated Miami Trace 6-0 and Jackson beat McClain, 6-1. Washington is at Chillicothe Thursday at 5 p.m.
Trent Langley drives the ball forward for the Blue Lions during a Frontier Athletic Conference match against visiting Hillsboro Tuesday, Aug. 29, 2017. Also pictured for Washington is Jack Luebbe (11).